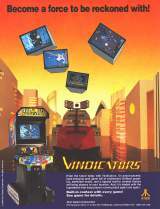 Vindicators © 1988 Atari Games Corp.
As team commander of the SR-88 Strategic Battle tanks, you must face the evil invading forces of the Tangent Empire. They're invading the galaxy with 14 space stations designed to defeat your team. Turrets and highly mobile armoured tanks are constantly on patrol to protect the fortifications that Tangents have built. With limited supplies and weapons, you must make a last stand and attempt to defeat the invaders. The most powerful weapon in your arsenal is the SR-88 Battle Tank, but their fuel supply is very volatile. 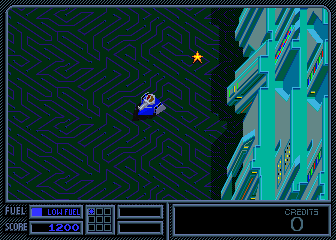 You must constantly replenish its fuel by picking up fuel canisters throughout the stations' many levels. Battle stars can be found along the way. These are vital to enhancing your tank and adding weapons. Process generators can convert the battle stars into powers and weapons while in transit between levels and stations. Only with these customized tanks can the evil Tangent Empire be conquered. As you defeat each station, demolish its control room and take the supplies the fleeing Tangents have left behind. Proceed in their mothership to the next station for another battle. Vindicators was released in April 1988. This was quite a year for Atari and tank games, since they also released "Assault" in 1988. 1,605 dedicated units were produced in the USA only. The selling price was $2,395. The dedicated cabinet is a real favorite among some arcade game collectors. This is probably due to its unique shape, it is shaped a lot like a tank, with tank treads holding up the bottom section of the cabinet. 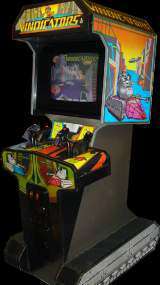 The top half is decorated with sticker sideart that shows scenes from the game, and these same graphics generally carry over to the control panel and the front of the machine. The control panel features four tank handle controllers. A Vindicators dedicated cabinet can be seen in the Nickelodeon show All That (from 1997 to 2000). However, it used a fictional marquee which was made for the show. Also, 114 conversion kits were produced in the USA only (released in February 1989). The selling price was $795. [US] Sony PS2 (nov.18, 2003) "Midway Arcade Treasures [Model SLUS-20801]"
[US] Microsoft XBOX (nov.24, 2003) "Midway Arcade Treasures"
Nintendo GameCube [US] (dec.18, 2003) "Midway Arcade Treasures [Model DOL-GAKE-USA]"
[EU] Microsoft XBOX (feb.6, 2004) "Midway Arcade Treasures"
[EU] Sony PS2 (feb.6, 2004) "Midway Arcade Treasures [Model SLES-51927]"
[US] PC [MS Windows, CD-ROM] (jan.1, 1999) "Arcade's Greatest Hits - The Atari Collection 2"
[US] PC [MS Windows, CD-ROM] (aug.27, 2004) "Midway Arcade Treasures"
[EU] PC [MS Windows, CD-ROM] (nov.23, 2004) "Midway Arcade Treasures"